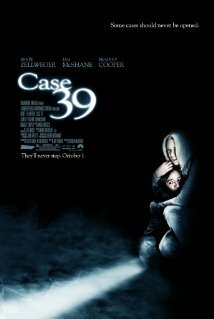 Case 39 is a movie about a well meaning, over-worked and underpaid child social worker (Zellweger) who reluctantly takes in a young girl (Ferland) who has been assigned to her already heavy case load. The child is assigned case number 39. Lilith is a young girl who has seemingly been put through hell. Unfortunately, there is more to this scared, abused and beaten down child than anyone who is alive actually knows. Though I am not a Renée Zellweger fan, the woman has great range and can act. She carried the film off well. Jodelle Ferland, (Lilith) the girl, has a knack for playing the creepiest kid on the block. She does it well and is notorious for making you feel uneasy in her on-screen presence. I actually enjoyed this movie. The characters were not played over the top as they often are in this genre and there are several surprises waiting for you… around a corner… under a box. On the other end of the telephone. When you say “…and there are several surprises waiting for you… around a corner… under a box. On the other end of the telephone.” you got me scared because I don’t like under a box – it’s scary!